They are absolutely delicious and very addictive, they are made with rich and creamy milk chocolate. 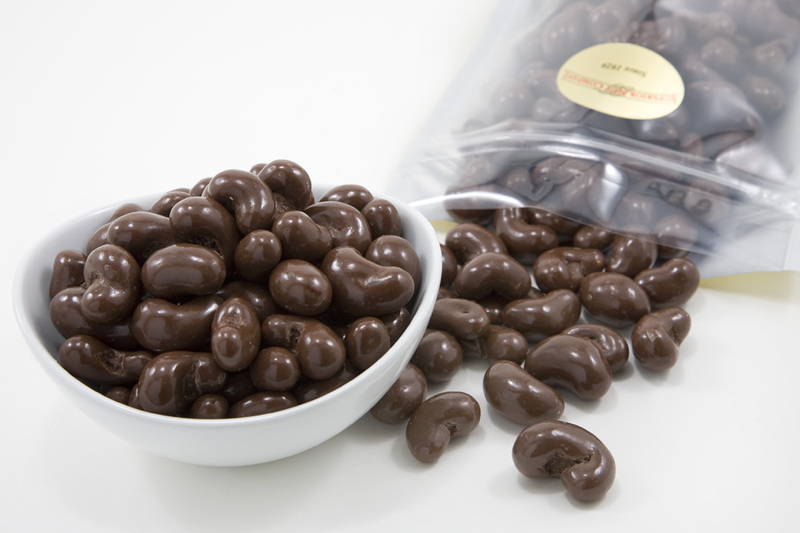 Our Chocolate Covered Cashews are guaranteed to please friends, family, and anyone else lucky enough to try them! Chocolate Covered Cashews - Net Wt. 1lb. Confirmation with tracking provided promptly. The nuts arrived exactly when promised. They were a gift to my cousin who will only eat the chocolate covered nuts from Superior. S he called me and said they were the freshest tasting nuts she had ever had. and my voracious appetite for cashews, the order was consumed by us in three days They were simply Superior! I have not sampled these chocolate covered cashews because I purchased them for gifts but the packaging was definitely "Superior"! They are in heavy duty plastic bags and were all shipped in a tightly sealed pouch which included a brick of ice. Very nice!! The packaging is attractive and I have no doubt that the product is wonderful!! I look forward to giving them as gifts. The Cashews were real fresh, I just wished that there more larger Cashews. I ordered (5) bags and I would says out of the (5) I probably got (2) good size bags of Cashews. I thought for the price I was paying they would all be the same size. I have the others here to give to my Grandkids and Great Grandkids when they come to visit, because I don't like the little ones. Family were fighting over these....delicious and fresh! Wish I'd ordered more!! I bought these for my father for Christmas and he loved them. We'll be ordering more for his birthday. Ordered cashews to be sent to my mother in another state. order from them in the future. ProsFast service and fresh products. Melt in your mouth chocolate over giant salty, crunchy cashews. Nothing could be better! It was a present for Easter. The person liked it. Valentines gift for my husband and he loved them! They were too good! They were a Chrisstma present and I thought I better just taste them to be sure they were O.K. so itâ€™s a good thing that I ordered 2 bags because they were more than O.K. They were wonderful. I also buy your pecans in the can from Wal-Mart and just noticed that they are made by Superior. Wonderful products. Thank you and Merry Christmas. These were very good and I appreciated the fast shipping.